On the left side of the screen you'll see "untitled", shich looks like a fodler. LMB(LeftMouseButton) it and rename it to something more fitting. In my case I called it "wod" which is kinda stupid, in other cases I usually called it "sound". 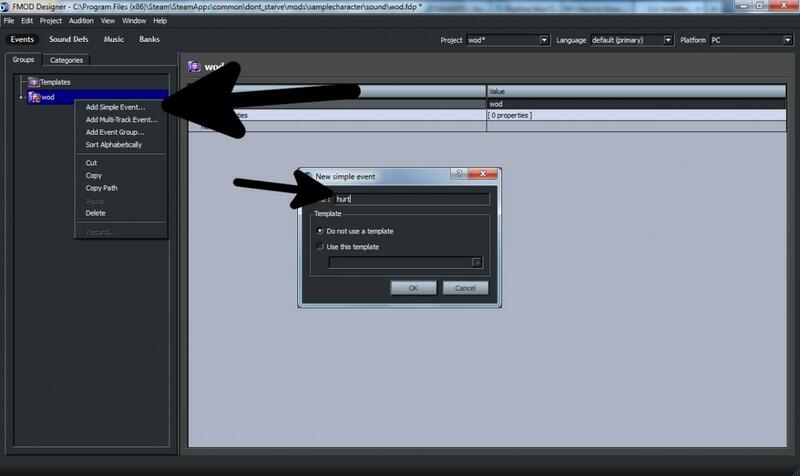 Let's just call it <folder> for the rest of the tutorial. 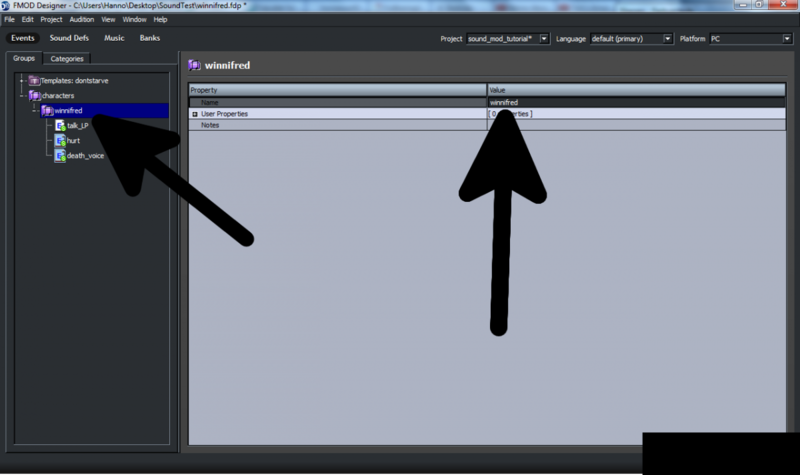 RMB <folder> and choose "Add Simple Event" and call it "hurt". No placeholder this time, best we use this nomenclature for all our characters. Add two other simple events called "death_voice" adn "talk_LP". In the meantime you'll see something called "event00". We don't want that RMB it and choose "Delete"
Let's go back to "hurt". RMB in the gray area in the middle of the screen and choose "Add Sound" and search the sound you wish your character to make when she/he gets hit. Repeat for "death_voice" and we're done with the two. Let's move on to talk_LP. Have you ever noticed that examining an object in game yields different sounds? I hope you have, cause all of them are pretty neat. 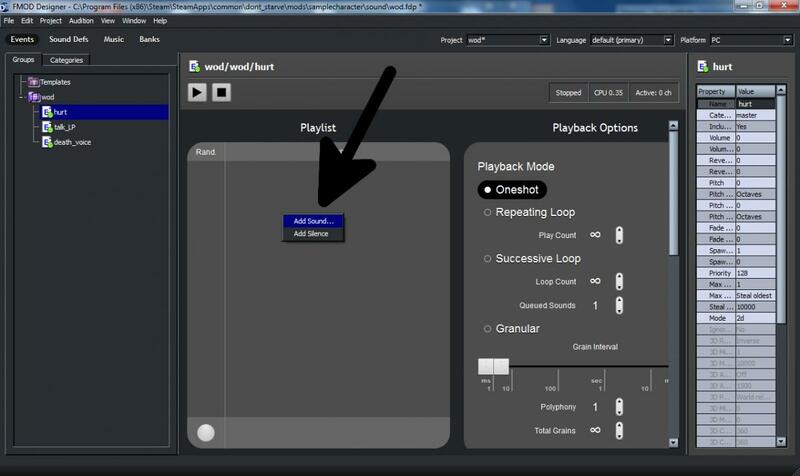 We do the same for our character and when adding sound simply select all the sounds we want to hear later. 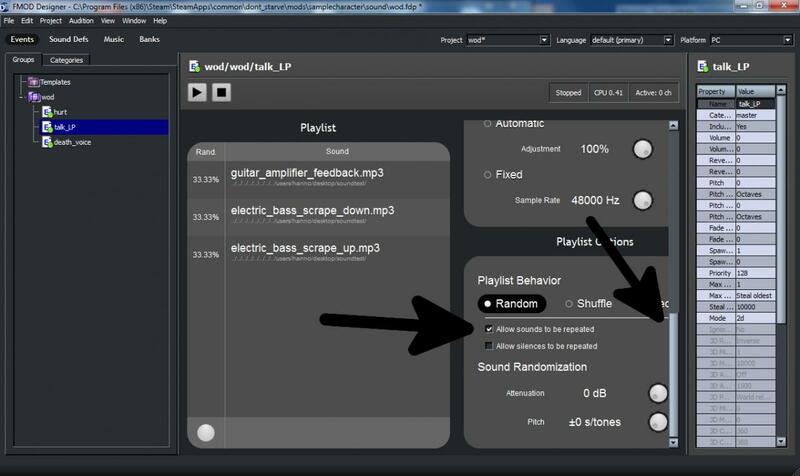 This will then add all of the sounds and assign them a probability equal to 100(amount of files). Wait what? 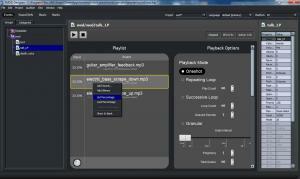 You can add probability to your sounds? Right now these percentages are kind of moot. 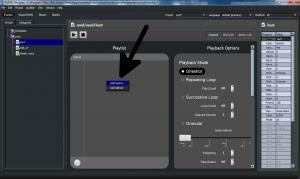 Scroll down on the right side and tick the box "Allow sounds to be repeated". You might not want that, but I really prefer it. Now for pure asthetics go to the banks tab on the top and rename your bank to <filename> as well. Press CTRL+B, tick the box beside your bank and hit build. Close FMOD Designer, we're done here. and remap the sounds which will be used. I hope this has helped someone at least and we'll see some characters in the future with their own sounds. If I'm not mistaken there's only the minimapicon which is left to be customisable, or am I mistaken? 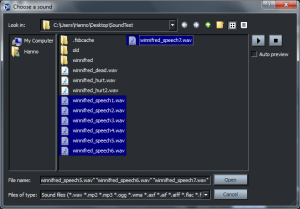 Step 1: Put all your files into your characters sound folder (i.e. "mods/waverly/sound/") If that doesn't exist simply create it. 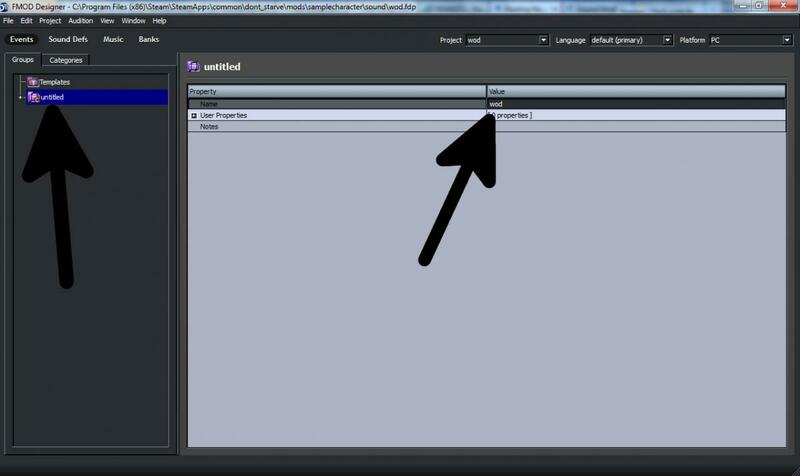 Step 3: Open the *.fdp-file, left-click on "talk_LP" on the left side of your screen. 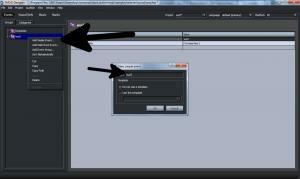 Right-click in the gray area. 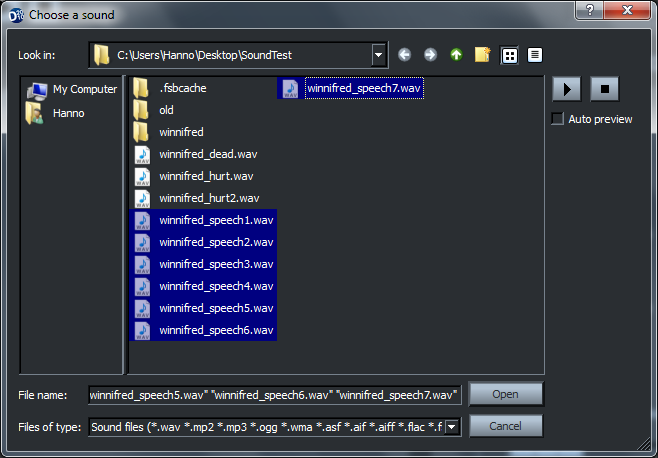 Select all sound files you wish to use for the speech (that is when the character examines something) and click open. Step 4: Repeat Step 3 for "hurt" and "death_voice"
Step 5: Press CTRL+B, check if the box next to your characters name is checked and hit "Build"
Hint: Don't forget to replace "waverly"
Step 8: Go back and check if you really replaced al instances of "waverly". 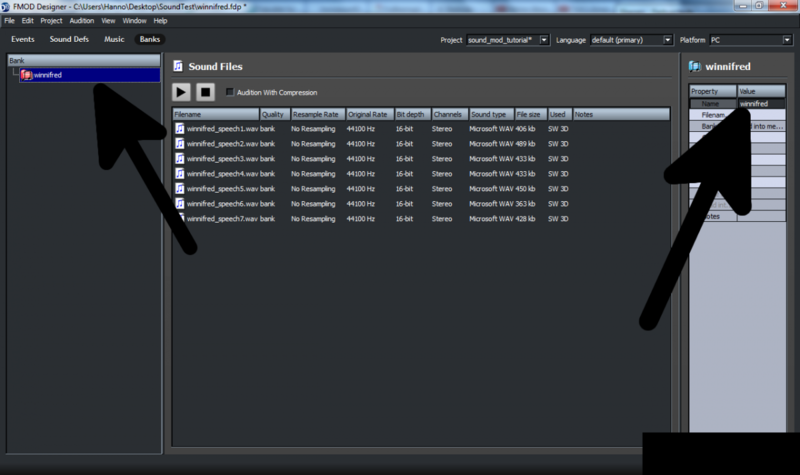 In the first case rebuild your soundfiles. I have a question, where do you paste the RemapSoundEvent in the <character>.lua? I pasted it in a couple places and it keeps crashing my game. 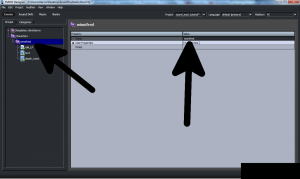 Still in modmain.lua, not your characters lua-file. That one only needs one line edited. Hey thanks a bunch for the tutorial! That's an awesome tutorial . 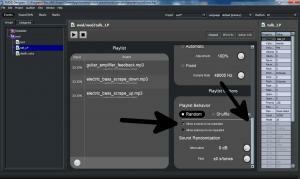 Our sound guy read your tutorial and put this FMOD project together for you. 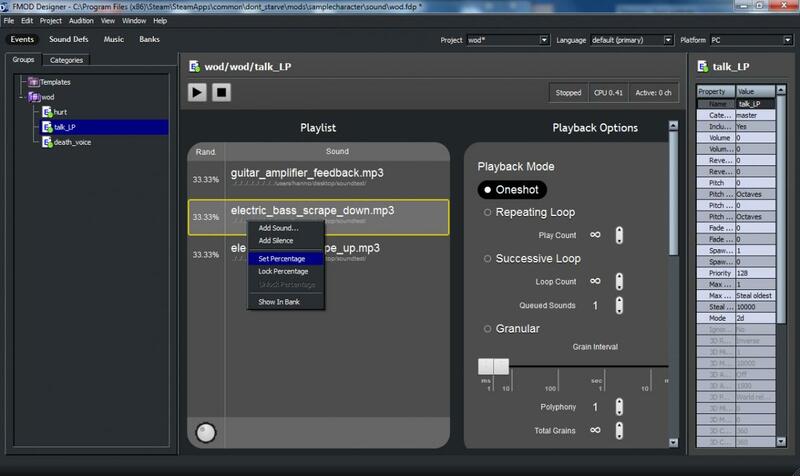 It's similar to what you create in your tutorial but it has a bunch of settings setup for the voice events so that they will sound closer to what you hear in game. Thought you might be interested in taking a look. 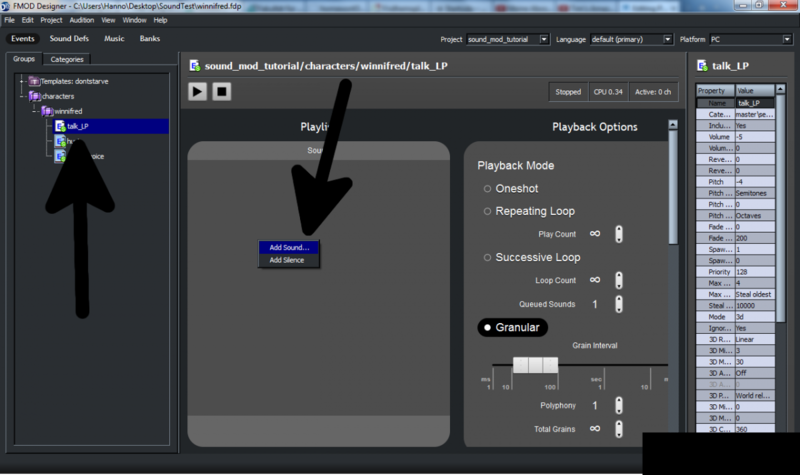 Now I might just be a big dummy, but where can I get that FMOD project and how is your "sound guy" called if I may ask? EDIT: Or is it the one in your tutorial with the updated folder structure? EDIT2; Yes I think it's that one, since it contains a big bunch of options that are different. But I'll wait with updating the tutorial until I know for sure. Gah I can't get this to work, I've managed to get it not to crash but it's always silence, it took me half an hour of random guessing from your "<file>/<folder>/talk_LP" comment as I'm new to it and there's no finished example but figured it out... Still all I get is silence. in the prefab file, I've tried different character names like "weav", "weavsound" etc as you don't explain what specific type of character name it uses, but I'm really stumped. I apologize for the poor choice of words, as soon as I hear word from Cheerio I'll rewrite a big chunk of the tutorial. <Character> is the name of your character, in your case that something like weavil if I'm not mistaken. When I'm on my PC I hope I can post a corrected version of your code. Yeah inside the fev/fsb file it's characters/weavile/ then the hurt, talk_LP and death_voice, I've been testing the talk_LP with .wav and ,mp3 files to see if that was the problem but it's still silent... I feel I've done everything right but it doesn't work... if there's any additional info you need just lemme know. For remapping any existing sound and/or music I'll have to redirect you to the tutorial I have linked in the first post. It's based off of the Wren mod (which I will say and thank Sukoushi for when it's done (also sorry). I wrote "Weavile" because that's the characters name and how it's spelt throughout the coding when not referred to as 'weav' (Weavile the Pokemon) and is the name refered to in the Fmod project (which your fixed code spelt as 'Weavil'). All sounds currently are retarded random placeholders, I don't know what I'm doing wrong, I tried to keep as close to the tutorials as possible. Next thing is I'm quite sure you cannot rename you are not allowed to rename your fsb-file or fev-file. 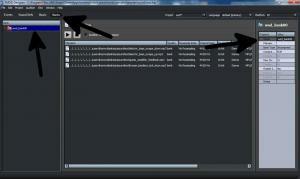 On building the fev one should've been called weav.fev since that's the name your fdp-file is called. Try that and reajust your code accordingly when it doesn't work I have no clue for now. Maybe you could also post your log where it says it doesn't find a file, you can also see that ingame by pressing CTRL-L.
EDIT: useless FMOD info as I misread the last post. Thanks for trying either way... I can always use a default voice for Weavile if this brings nothing up, though my next one (with the currently unplayable, faulty weapon) would def. benefit from a voice change. Okay, what KI meant was the log.txt when you try to make your char talk. If I see something like "blabla" couldn't be found then I know at least a bit more-. "Orphaned unnamed resource. This resource must have used Add( resource ) to insert itself into the manager." Is what I get in the Documents/Klei/Dontstarve/log.txt when I check... Maybe the other examples and guides were old and didn't cover this statement? I'm the audio department here at Klei. Jason Garner is one of the awesome composers that does all the music for our games. Music is him along with Vince De Vera neither of whom frequents the forums. I do try to pop in when I can to check on audio related questions. It's really cool to see the mod community taking on sound changes. That error message doesn't have anything to do with your problem I guess. And if I do everything I told you with your mod it works. So I can't do more for you here.